The Baltic Classic Circle was set up in 2010 with the aim of rejuvenating the Baltic racing tradition. The Circle compromises eight regattas taking place in a variety of venues across the shores of Sweden, Finland and Helsinki. G.L. Watson & Co. have supported the event by donating the winning trophy. G.L. Watson’s Managing Director commented: “It is our wish that the efforts of the Scandinavian classic yacht owners and designers are recognised internationally for the fundamental role they have played and continue to play in the history of yacht racing”. The most eager participant of the event was Vegabon, which participated in six of the regattas. However, it was Nika from St Petersburg who won overall. 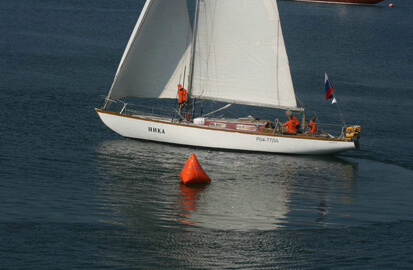 Nika is an L6 one-design offshore cruiser from the Soviet years and participated in three of the event regattas; the Arkosund Trosa Coastal Race, the Royal Palace Regatta and the Pommern Regatta in Mariehamn, Finland. Last year Nika finished in third place and victory was unexpected. Nika’s Captain, Vadim Manukhin commented: “Yes, we are surprised. We wanted to win, but we didn’t really think we would finish first!”. Last years winner, the Swedish 10mR Itaka, came second and the offshore cruiser Kersti from Finland came third. Nika will receive the cup at a classic yacht event in Stockholm in a couple of months. An interview with the cup’s winner will be published in the November issue of Classic Boat Magazine.